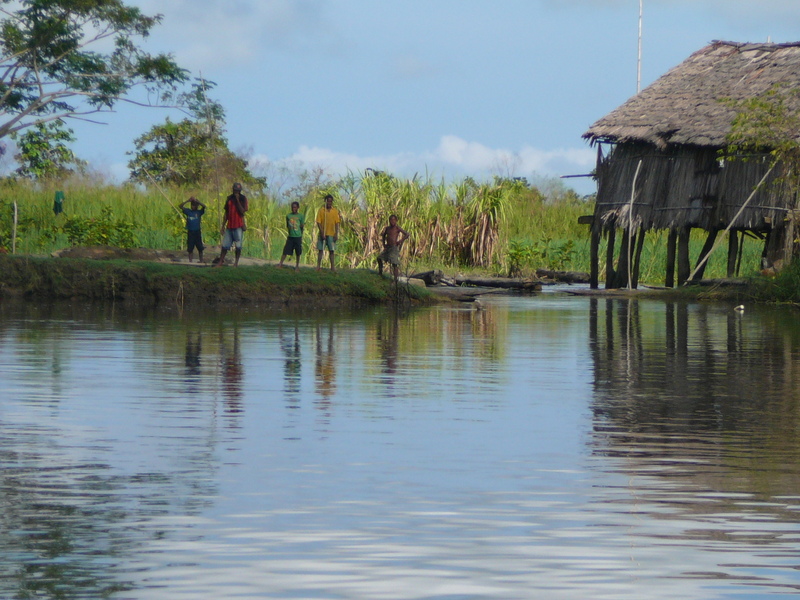 Our first day on the Sepik River is a bust. Thanks to the problems at the airstrip and unloading the previous passengers, we are several hours behind schedule and we have pretty much lost a day . Our ship has to try and make up time as we travel up the river, but there’s only another two days before we are expected at the Lodge. There’s a lot of traveling to be done. 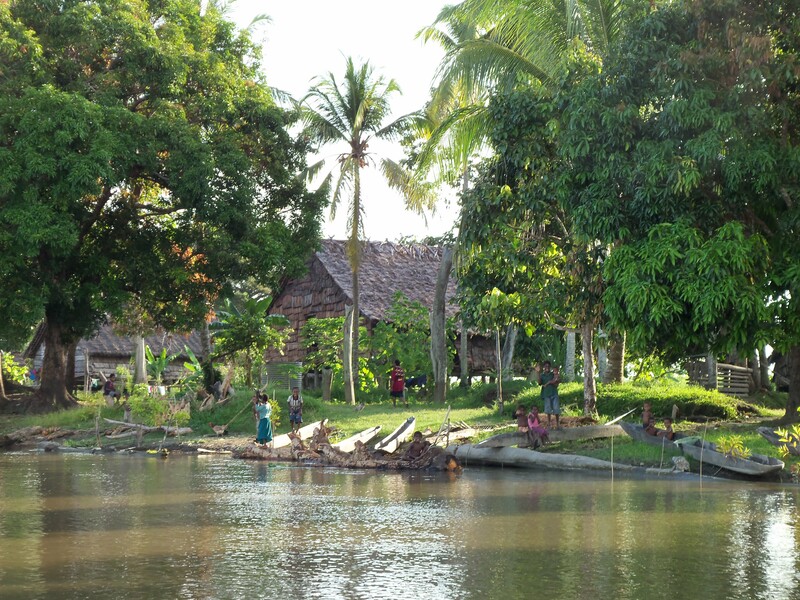 We are in the The Middle Sepik Region which is populated mainly by the Iatmul Tribe who inhabit small, traditional villages along the banks of the river and its tributaries. We are going to try and visit four of those villages on our first full day. The ten of us clamber on board. The jet pontoon is fast and at full throttle very exciting. Propellers are impossible on the river because of all the debris, and jet engines are the only option. 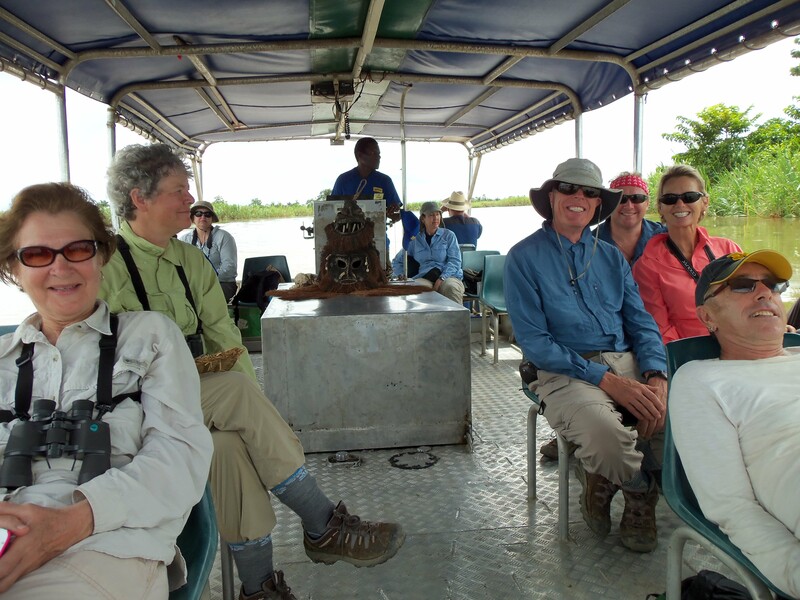 The plan is for us to forge on ahead of the ship and visit the villages. While we are doing that the ship will continue on up the river. At the end of the day we will go looking for the ship (we will still be ahead of it) and join it for the night. The land is very flat and so the river curves in sharp bends this way and that, and when the pontoon is going at full speed it feels like one of those thrill rides where you pay a great deal of money to be strapped into padded seats and get soaked as the high speed boat rushes through the water. But we have no safety straps and sit on molded plastic seats attached to the pontoon floor. 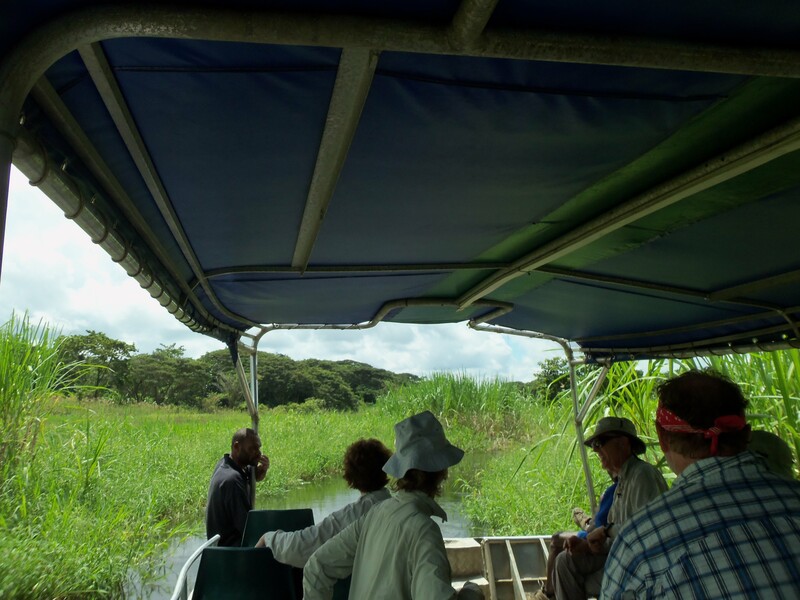 There are wild birds everywhere, birds of prey continually swooping to catch fish while white cranes and grey herons travel alongside us effortlessly matching our speed. 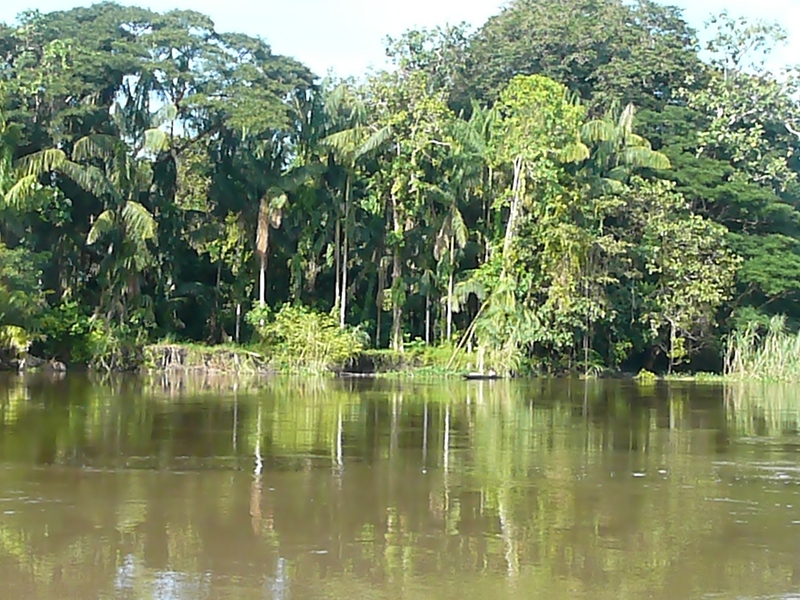 The river is deserted except for the occasional dugout canoe, the only form of transport the tribes have. They are literally dug out of a log and look rather precarious. Despite that the men stand in the canoe to row. Our pontoon always slows to almost a standstill when we see one as the wake will tip them over. 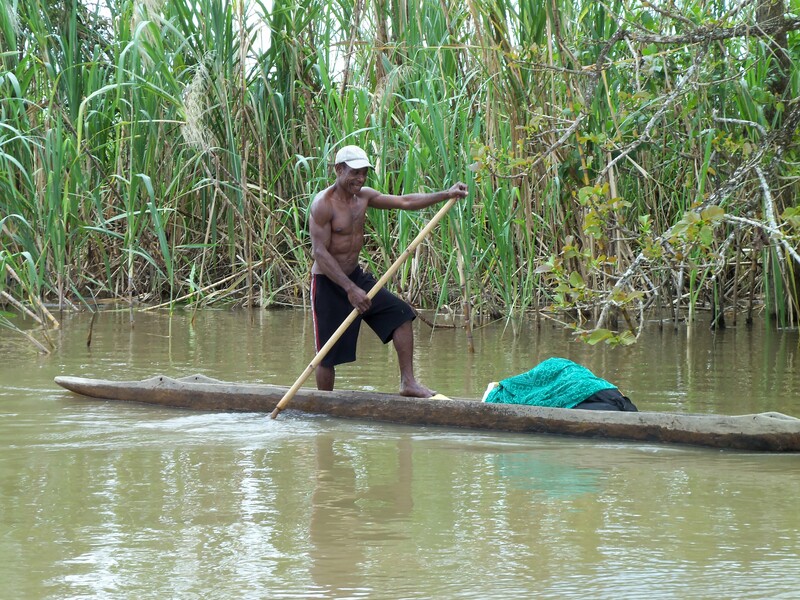 Even so, the canoes usually beat a hasty retreat to the river bank, or disappear into the reeds which offer some protection. The women, being much more sensible, sit to row. 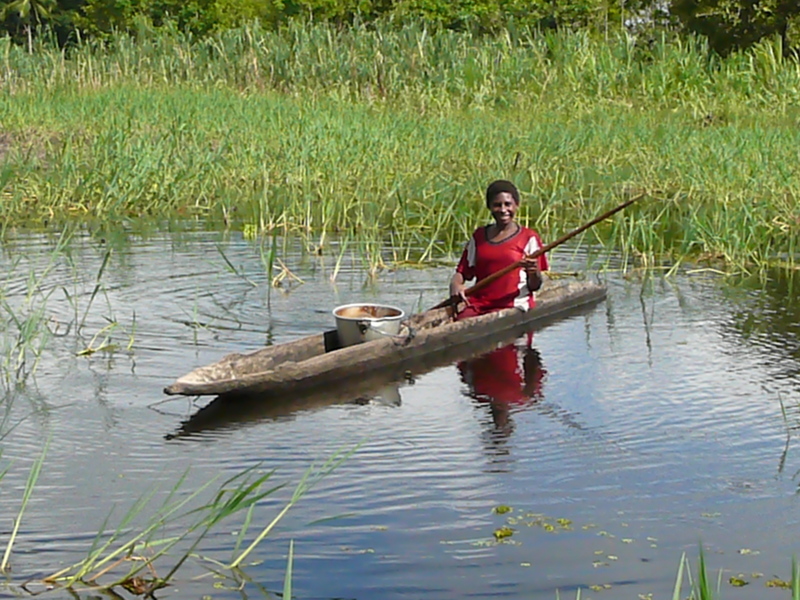 They often have a big cook pot in the front of the canoe into which goes any fish they might catch. Every so often we pass a small village perched on the river bank. They have to clear a strip of jungle to build their huts, but they always leave trees between the huts for shade. 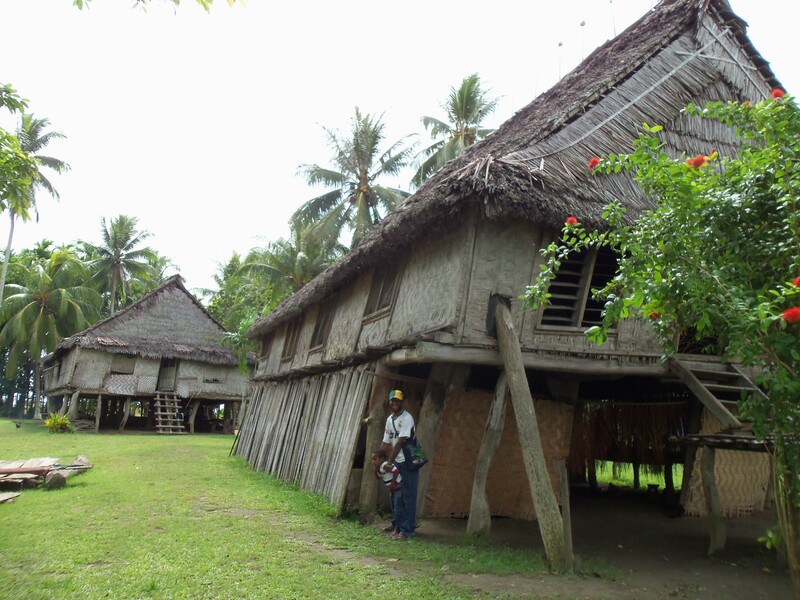 The huts are completely different from the Huli’s huts, although they are still built with bamboo, reeds and palm leaves. They have open windows and are built on stilts to protect them from the frequent floods. Several dugout canoes are tied to the bank and children are playing in the river. From our pontoon it looks idyllic and could be the cover shot for some beautiful tropical getaway. But on shore it is not quite so glamorous. We are never invited in to see one of their homes, perhaps because the added weight would bring it all crashing down or perhaps it isn’t accessible by foot! We are no longer in the Land of the Pig, nor are we in the land of family gardens and rows of perfectly planted vegetables. The tropical climate, the impenetrable jungle and the constant flooding necessitates a very different lifestyle. The sweet potato is no longer the staple diet. It has been replaced by the sago palm. There are no pigs, but there are fish. Mainly piranha. Your choice : pork and vegetables or piranha and sago. You already know how I feel. Actually the people here all look healthy, well nourished and fit. Perhaps it’s the many chickens we see that help the sago go down. There is no segregation of the sexes. Men women and children all live together and the large huts often house several families. Tribal life centers around the Spirit House, the most important building in the village. Some of these impressive structures reach 25 meters in height and emerge above the forest canopy. Others can be quite small. They are often open ended and the bigger ones can actually be on two floors. A fire is kept continually burning inside and the larger ones can have two or three fires. The spirit houses do just that – house the spirits of their ancestors. It is these spirits that are worshipped, and they need to be managed, appeased and appealed to for help. Aside from the totem poles there is often an amazing array of carvings including masks, statues and figures kept inside the Spirit House. Traditionally only initiated warriors are allowed inside, under penalty of death. This is a male dominated society. They control the religious life of the village and create all the carvings. Women are never allowed inside the Spirit House and are not even allowed to see some of the carvings. The women make secular items like bilum bags and baskets. A woman’s place is in the hut. Where is Alice when we need her. The carvings are created to be inhabited by spirits, but other than that we know little of their real purpose. This is because the tribal cultures in this area are centered around secret societies and only the initiated members of the village are allowed full knowledge of the rituals and carvings and the stories associated with them. Added to this is the fact that exploration of the tribes has been limited by the difficult access to the region. What we do know is that the carvings are intended to help the people meet the challenges of everyday life and to ward off the influences of unfriendly spirits. Many of the carvings are also used in ceremonies and rituals that mark the important stages of life. Each tribe has its own beliefs and the people recognize spirits, deities, totems and ancestors unique to their clans. As a result each village has developed its own artistic style, and it is this that has persuaded us to spend three days on the Septic Tank and to venture up the Septic River. 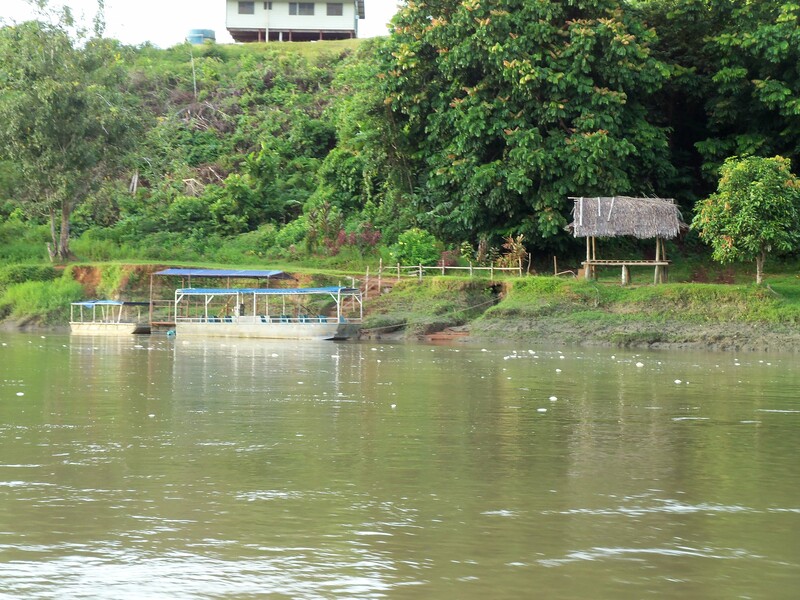 This entry was posted in Papua New Guinea, Sepik River and tagged Iatmul, sepik, spirit house. Bookmark the permalink.